Before I saw Murdered: Soul Suspect for the first time, I heard many comparisons to Ghost Trick, Capcom’s puzzle adventure game for the DS where you’re a ghost solving the mystery of your own death. Some comparisons were meant to be humorous and some not. Regardless, I take this as a compliment. In Murdered: Soul Suspect, you’re a detective who’s just been killed. Unable to resolve your own death, you remain as a ghost on Earth in the spiritual city of Salem, Massachusetts. No longer able to interact with the physical world the way you are used to, you’ll have to use your array of ghostly powers to find out whodunnit and why. The first two games that pop into my head when watching the demo of Murdered: Soul Suspect are Ace Attorney and Ghost Trick. The latter because you interact with the environment through possession and limited poltergeist powers, trying to get clues and solve problems. The former because once you get all this information, you have to deduce new information from what you have learned to move the story forward. This feels good because as a ghost, you can learn things normal humans can’t. You can interact with ghostly figments and remnants to uncover memories and glimpses of the past. Combine this inhuman information with old-fashioned detective knowledge, and you can get an edge on what a normal human would be able to know. The demo takes us from the moment Ronan O’Connor, the protagonist, is killed by being thrown out of a window and then being shot seven times. Appearing as a ghost, his memory as to how he just died is fuzzy. Using detective skills, he finds the scene of the fight between him and his assailant, and then he is off to follow the trail as fast as he can before it is too late. Besides trying to find his killer, Ronan can start sidequests. For example, he can find other ghosts like himself, stuck in the earthly plane until they can resolve the unfinished business or concerns that keep them in ghost form. Ronan helps one ghost find where her corporeal body is buried, and a quick look in a nearby apartment gives him all the clues he needs as to the woman’s body’s location. He returns to tell her, and she thanks him before disappearing. This sounds like a great, unique detective caper, but someone, likely at the publisher, decided to add combat. There are spectral demons that you will encounter, that want nothing more than to consume your spirit so that you’ll die… again. You’ll have to sneak up on them from behind to explode them into bits. Alternatively, since you are a ghost and can walk through walls and most forms of matter, you can just break line of sight by walking through a wall. Honestly, I don’t think I will like this part of the game when I get my hands on it, and I didn’t like it when I saw it during the eyes-on demo. I worry that it will break the pacing of the game. The developer, Airtight Games, has had a mixed record, releasing both Dark Void and Quantum Conundrum in the past, which is why I’m both excited and a little bit skeptical about the quality of the game in the end. Still, this game has jumped its way into my “watch” list because of what I’ve seen. 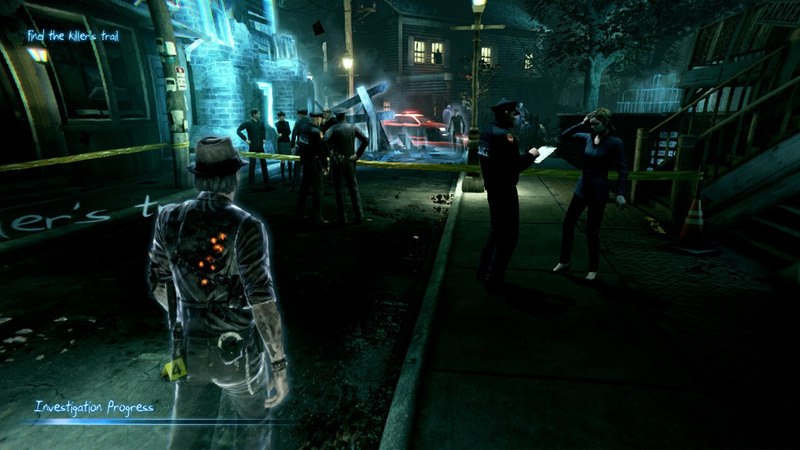 Murdered: Soul Suspect will release in 2014 for Xbox 360, PlayStation 3, and PC.